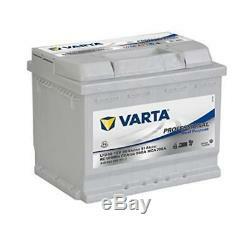 Varta Professional slow discharge lfd60 battery boats, motorhomes, leisure, 12v 60ah 560 amps (en) - free shipping! Product Dimensions: 24.6 x 17.5 x 19 cm; 16.8 kg. Average Customer Review: 4.0 out of 5 stars 3 customer reviews. # 17 in auto and motorcycle> auto spare parts> batteries and accessories> car batteries. Dimensions: 246 x 175 x 190. Amperage: 60ah & ## x2f; 560a. Dimensions 12v 60ah 560cale length (mm) - 242width (mm) - 175capacity (mm) - 190weight (kg) - 16type of terminal - terminals adisposition - positive right ideal for caravan, boats, leisure use and much more. Warranty 2 years description Leisure varta batteries guarantee a constant energy supply where there is no power outlet: in motorhomes or sailing boats, on the roads as well as on the seas. It also provides the energy needed for the proper functioning of traffic lights and solar installations. Reliable reliability and superior quality make it an optimal source of energy in all circumstances. When it comes to mobile power supply, leisure varta is ready to face any challenge as specific as it may be. It reliably and reliably delivers the required power every day where there is no power socket and withstands a deep discharge up to 60% of its capacity. Not content to provide all the energy required over the long term, it recharges very quickly and therefore immediately ready to respond to other extreme demands. Very limited stock at our supplier "" no additional stock guarantee due to high demand "" only available for a very limited time !! with our shop, forget about the stress of late deliveries (see our reviews). Our partners are committed to delivering your parcels as soon as possible, quickly, easily and efficiently! Some products are not deliverable by mail. Corsican, overseas, Guadeloupe, French Guiana, meeting and the Canary Islands in Spain. Thank you to send us a message before ordering so we can confirm the delivery or not! To all addresses other than apo / po boxes in France and Belgium. Our stocks are in warehouses based in France. All orders are shipped via DHL, post, chronopost or ups (depending on location and package weight). Unless otherwise stated, all orders will be shipped within 48 hours of the date of your payment. Check our positive reviews to see the good reviews on the speed of our deliveries that we offer. To all addresses other than apo / po boxes in the lower 48 states, france and belgium. Our stock all ships from our france-based warehouses. If you are not delivered or the item does not match its description, they will refund you and help you find a solution with us subject to conditions. We are not responsible for any purchase after this 30 day period. Return shipping costs are the responsibility of the buyer unless return is the result of our error. We pay the referral fee if an exchange is requested. If you have any questions please contact us by "ask a question to the seller. We will reply you within 1 business day or less. All returns must be made within 30 days from the date of purchase and only with our return label! Please note that we can no longer refund after the 30 day limit. When returning, please note that it may take up to 7 business days for the return to be processed. We do our best to treat as quickly as possible. We stand behind our products. We can not wait for it as soon as possible. For the attention of the rights holders !! we will then remove all ads with your trademark that have been unauthorized use and we will ensure that such unauthorized use is not repeated. We can not be held responsible for any violation of a trademark right from the date on which the owner of the mark, notwithstanding the discovery of the use of the mark by our store, has allowed this use to continue. Such an absence of reaction can be considered as an implicit authorization of the mark in the context of this announcement. The item "varta professionnal slow discharge lfd60 battery boats, motorhomes" is on sale since Monday, September 10, 2018. The seller is "giftstrend" and is located at / en fr. This item can be shipped to the following country: France.